Why Might You Need These Healthy Lactation Cookies? What are lactation cookies, what makes them work? How I converted the typical oat and peanut butter cookie into an amazing healthy vegan lactation cookie powerhouse! How fast will these lactation cookies work? Do you want to keep track of your milk supply to help make more milk? 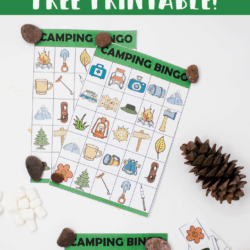 Check out this set of trackers + quick reference guides! Here’s my sweet treat lactation cookie to boost your milk supply! If this is too much cooking, buy these lactation cookies that are pre made and just need to be baked! For more Breastfeeding Information check out these articles! In general, if you are able to nurse regularly, your supply should regulate itself and you may not need these healthy lactation cookies. However, if you are away from baby for awhile and have to pump your supply could take a hit so you might need a lactation supplement. 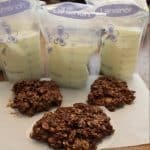 Lucky for you, I have a delicious no bake lactation bite recipe! ✔️Check out the Top 5 Rated Milk Booster Bars and Cookies! Look, I know in an ideal world we’d make everything from scratch. But you’re a busy mama! These cookies are highly rated, WORK WELL, are pretty healthy, and come already mixed and ready to cook! Show me the TOP RATED milk supply boosters! I recently got an abdominoplasty done, and am at the moment nursing twins. I was super concerned about losing my supply after all the trauma my body went through, as well as having to pump only and not be well enough to have them nurse. I decided to convert my favorite unhealthy oatmeal cookie into a powerful, healthy breast milk cookie! 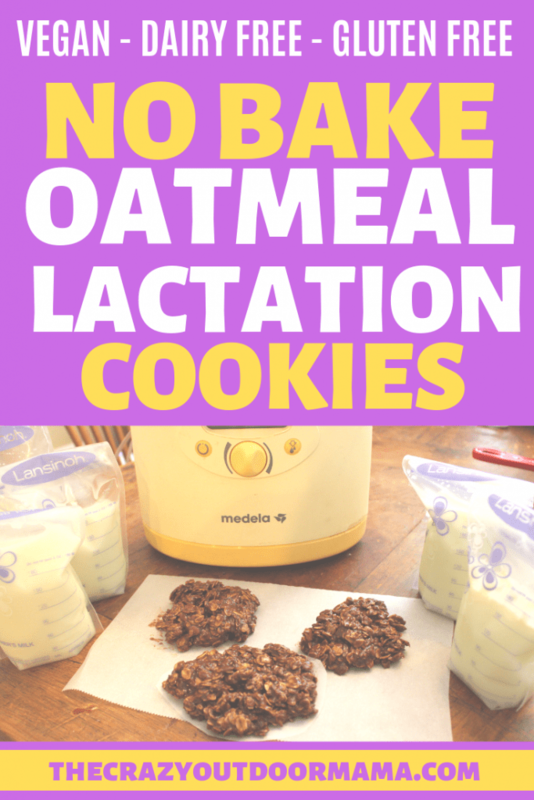 These are no bake lactation cookies, so that makes them even faster to cook. This lactation dessert is sure to help your milk supply! 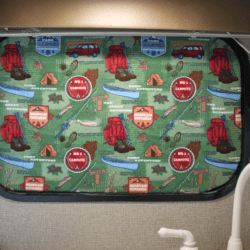 If you need more help, check out these other ideas! 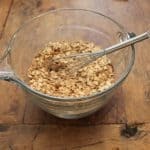 If you’re tired of oatmeal recipes, check out this article that has TONS of other lactation recipes! There’s a ton of recipes for items that can increase your milk supply, and they all fall under “Lactation (item name)”. They are generally classified as such because of the ingredients in them, which I listed below. From my research on google and various lactation sites, this is what I found. These are the key lactation ingredients! 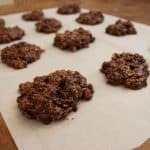 My ULTIMATE favorite cookies are “Wacky No Bake Cookies” AKA Oatmeal Chocolate, Peanut Butter cookies. But here’s the problem; a lot has changed since I last made these favorites; namely I eat clean now and try to avoid processed sugars as much as possible. So how can I make this cookie into a healthy lactation cookie and still taste good? I was even hoping to make this an egg free lactation cookie! Here’s the recipe before, and the comparison to the new recipe. 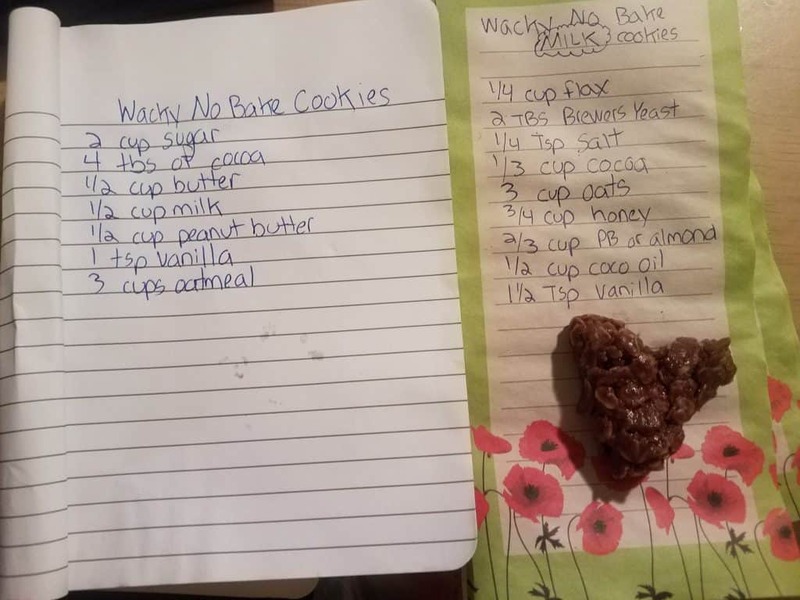 I needed to turn this no bake cookie into a milk supply booster that also followed my healthier lifestyle; no gluten, no dairy, and no added sugars. While it does still have peanut butter, that can be switched out for something like almond butter instead! A comparison to the normal, processed sugar no bake oatmeal cookie, and my delicious one sweetened naturally with raw honey! Every time I eat one or two of these oatmeal no bake milk making cookies, I notice such an immediate increase in my supply I get a clogged duct within a couple of hours! Everybody is different, but I’d definitely expect results within a day! These healthy lactation cookies use brewers yeast which I really think is the magic ingredient to get the milk flowing! They also use oatmeal, which means they are also gluten free for those who have that dietary need! I ate these cookies while my twins were in the NICU, and so really wanted to keep a close eye on how much milk I was making. After a while, my little yellow note pad got boring and I wanted something prettier! That’s when my pumping journal and quick reference guides were created! Constantly looking stuff up on google and writing on sticky notes got old! A pumping log to keep track of how many ounces were pumped from each breast as well as date and time. If you are not pumping, simply sub ounces for minutes nursed from reach breast! 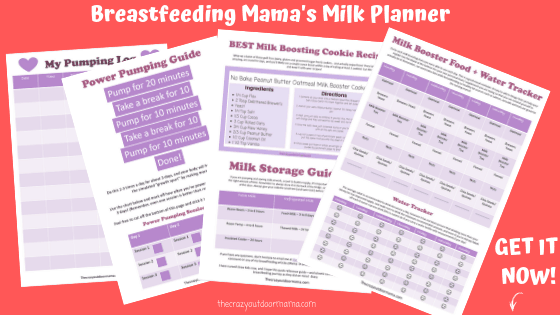 A breastfeeding food and water tracker that gives healthy breastfeeding snack options for each day, as well as a water tracker to ensure you stay hydrated! 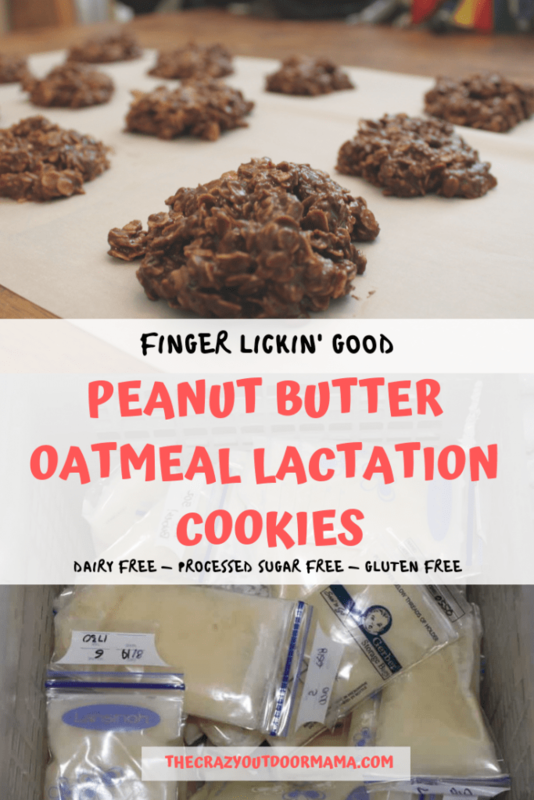 My popular peanut butter no bake lactation cookies, and a quick reference storage guide! Enjoy the delicious flavor of peanut butter and cocoa, with the milk supply boosting powers of oatmeal, flax seed and brewer’s yeast. These cookies are dairy, egg , gluten and processed sugar free, but you would not know it from tasting it! Combine all your dries into a medium bowl (Flax, Brewer’s Yeast, Salt, Cocoa, Oats). Mix them together and set aside. 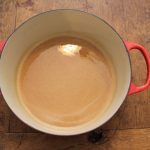 Add all your wets (Peanut Butter, Coconut Oil, Honey, Vanilla) into a pot. Heat until just able to combine. If you boil this, the sugar make up will change and they will become too sweet and not near as moist. Once the wets have just combined, dump in your bowl of dries. Stir until all the oats are coated. Once cooled, put them in either an airtight container or ziploc bag. I tend to keep them on their parchment paper as they are sticky and stay very moist, and so have a tendency to meld together if not separated by something. I eat two or three a day and notice I am able to pump an ounce more from each side than normal. This of course varies from person to person, so experiment! I hope the combination of the calories from the peanut butter and the supply boosting powers of flax, oatmeal and brewer’s yeast help you as much as it has helped me! 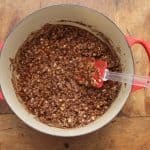 If you’re a busy mama and don’t have the time/ingredients on hand, try out the lactation cookies I linked below! They are not QUITE as healthy, but you can sub the butter for coconut oil. It also has flax, brewers yeast, and oats like mine, as well blessed thistle! They taste amazing, and I’ve picked them up in a pinch if I didn’t have time to make some for the week! If you are going to eat them over a long period of time, keep them in the fridge so that they don’t go bad. Looking for other healthy cookies or breakfast items? I also made a DELICIOUS, moist, and healthy (sugar, dairy, egg, gluten free) Raspberry Muffin recipe here! It’s powered by coconuts, and will explode in your mouth with flavor! The best solutions to common breastfeeding problems so that you’re prepared for anything! When it’s time to dry up your milk, learn how to do so without risking mastitis! I have a bottle of cooking coconut oil that doesn’t harden will that still work? Also do you flax seed or ground flax seed? Hm, not sure about the cooking coconut oil, I’m sorry! =( I used ground flax seed! If you do it, let me know how it turns out! I’m thinking that, if anything, they may just turn out even moister than normal! Yes! They freeze well, and that’s an awesome idea! Early congrats on your new baby!! 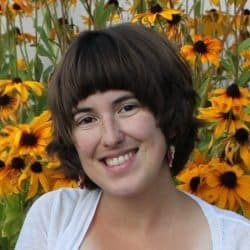 Is it safe to eat raw honey while breastfeeding? I know it’s a pregnancy no no but wasn’t sure about after. That’s a great question! I did some research, and here’s what I found! YES, you can eat raw honey while breastfeeding! Since moms have the stomach acidity to kill potential botulism germs from eating contaminated honey, there’s no risk that these germs will be passed to their baby in their breast milk. 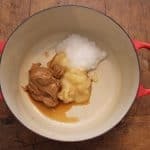 Can i swap peanut butter for butter in this recipe? Hmm, not sure! I’m thinking that may mess up the consistency and make them really runny or something. Then again, I’m no baker! If you try it, let us know! If you’re trying to avoid peanut butter, almond butter is less inflammatory and still tastes good with it! Hey! Those sound amazing, thank you for commenting with the recipe! I love that you added protein powder and more flax – everyone can use more protein, especially us breastfeeding mamas! I’ll be sure to link to your recipe!